About a week ago, I had the opportunity to give the Audemars Piguet Royal Oak Offshore Diver (ref.15703ST.OO.A002CA.01) a try. This Offshore Diver was introduced last year (2010) during the SIHH in Geneva and except for its steep list price, I haven’t heard a negative comment yet. 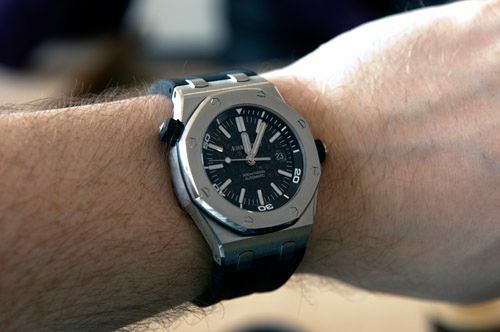 In the past, AP already released a few diver (or scuba) watches as part of their Offshore series. One of them was the limited edition for Wempe, restricted to 175 pieces only. Anyway, let’s not look back to the past models for too long and continue with the Offshore Diver 15703ST. Like all other Offshore models, the 15703ST has these typical rubber accents, like the crowns and the thick rubber gasket between the Royal Oak case and the octagonal bezel. Additionally, this Offshore Diver comes with a rubber strap only. Personally I am not too fond of this material in general (had one on a Panerai and have one for an Omega Seamaster Professional Chrono) but AP mastered to get a rubber strap that feels comfortable enough without being too soft. The rubber accents fit the black ‘méga tapisserie‘ dial perfectly and luckily AP didn’t choose to use bright colors this time to spice things up. 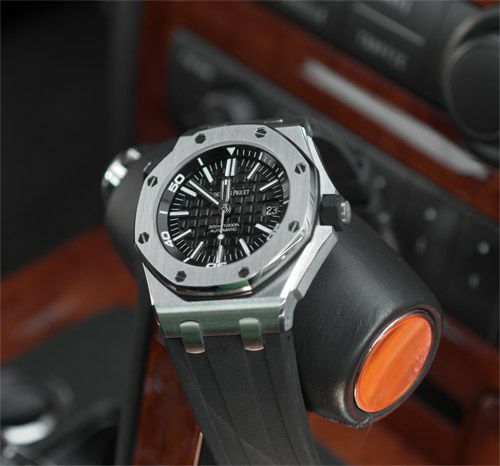 It is a plain black diver’s watch that could be interpreted as an understatement time piece by AP. One of the first things that I noticed about this watch is the comfort of wearing it despite the dimensions of 42mm x 13.75mm. My ‘regular’ Royal Oak watches measure 39mm in diameter which might look small for current standards, but these watches tend to wear a bit bigger because of the integrated bracelet and the ‘longer’ lugs. This 42mm Offshore Diver wears even bigger (from lug to lug this watch measures 55mm), but still looks very decent on my wrist. As you can see on the pictures, the Offshore Diver 15703ST has an extra crown at 10 o’clock. With this extra crown, you can operate the inner (diving) bezel of the watch. The dial is very readable, luminova has been applied to the hour markers and on the baton hands. Furthermore, the dial gives only the information needed: brand name, automatic movement and the level of water resistance. The brand doesn’t need further introduction here at Fratellowatches, as I have written a lot about Audemars Piguet in the past. The automatic movement is AP’s in-house cal.3210 with a power reserve of 60 hours and a very impressive finish. 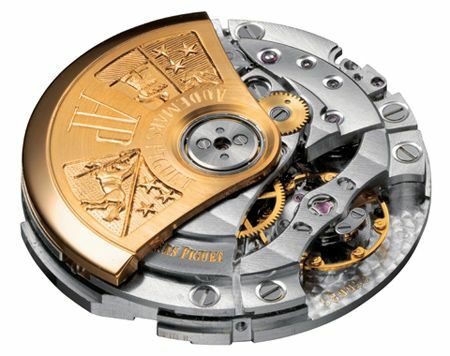 As shown below, the 22ct gold rotor has been engraved with monograms, the bridge and other middle parts are decorated by Côtes de Geneve and the base plate has been fisnihed with a technique call stippling. More about these finishing techniques can be read here. Although caliber 3120 is a very pretty movement to look at, AP chose to close the hatch by a stainless steel case back instead of a display back. As I had the pleasure of owning a Royal Oak ref.15300 at some point, I experienced the pleasure of looking at this movement once in a while. Perhaps it has something to do with ensuring a water resistance of 300 meters or that AP simply thinks a diver watch shouldn’t come with a display back, but the movement inside the Offshore Diver 15703ST cannot be admired. You just have to come back to this review and look at the picture above once in a while. 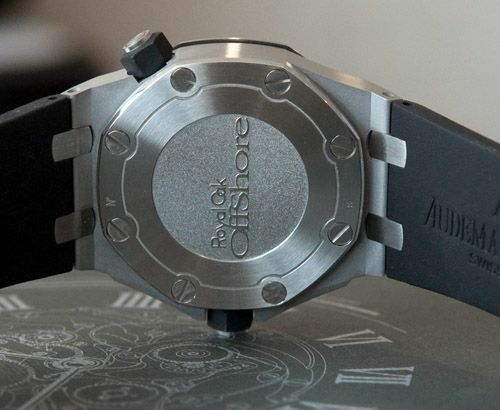 Anyhows, AP did a nice job on the stainless steel back with an embossed ‘Royal Oak Offshore‘ logo and the large screw heads. Furthermore, the case back shows two numbers. I have removed the numbers using photo editing software, but these numbers are a unique case number at 12 o’clock starting with a character from the alphabet and a sequential number at 6 o’clock. This particular model starts with an H, and should say something about the production year. However, this information is not disclosed by AP. The other number is the sequential number and is linked to the model reference. 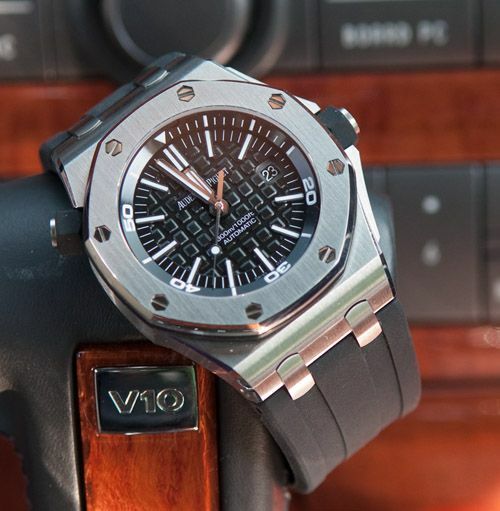 Like all other AP Royal Oak models, this Offshore Diver comes in a very nice looking wooden box with a small compartment in the carton box for the manual and warranty booklet. To summarize, this Offshore Diver is actually a Royal Oak Offshore model that I could definitely get used to. Although I like the Royal Oak Offshore Safari (reviewed here) and the Offshore Themes models, I always chose for the ‘regular’ Royal Oak models since they are a bit sharper with respect to the edges and beveled parts and don’t use piggy backing movements. I always found (and still do) the Royal Oak Offshore chronograph models a bit too expensive to have a add-on module for the chrono functionality. That just doesn’t feel right in my humble opinion. Luckily, this Offshore has a superb in-house movement inside. In comparison to the non-Offshore models, this Diver 15703ST has somewhat more rounded edges and I have to say that it didn’t bother me at all which probably has to do with the large(r) diameter of the case. If you like and if you don’t have any diving plans for this watch, you can exchange the rubber strap for a nice alligator horn back strap. There are even third parties that create very nice after market straps for these Offshores (and other Royal Oaks), APBands.com for example. Thanks to Van Beynum to abuse their VW Phaeton for some pictures. High resolution pictures of this review can be found here.